Welcome to the Department of Geographic Information Systems (GIS) for Vernon County, Missouri. OR… in simpler terms; we create and maintain electronic maps and databases that together improve our problem-solving capabilities by allowing us to see a “bigger picture” of how various information pieces interact with one another. 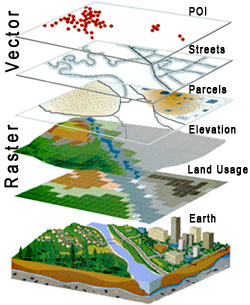 Online mapping programs offered By Google, Mapquest, and otheres are good examples of GIS for the masses. They provide basic services that the majority of us now take for granted — like being able to plan a road trip from point ‘A’ to point ‘B’, along with estimating the mileage, gas consumption, time, and stops along the way — all in a matter of seconds.